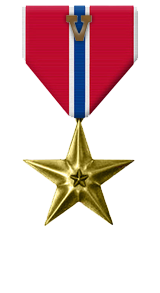 For heroic achievement in connection with combat operations against the enemy while serving as Fire Team Leader, Second Squad, Second Platoon, Company K, 3d Battalion, 3d Marines, Combined Joint Task Force-76 as part of Operation ENDURING FREEDOM. 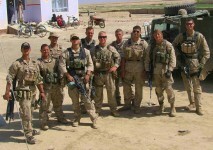 On 8 May 2005, in the vicinity of the Shatagal Village, Alishang District, Laghman Province, Afghanistan, Corporal Arndt led his fire team under the cover of close air support to close with an Al Qaeda and Associated Movement element that had initiated an ambush against his platoon. Corporal Arndt’s assault element confirmed two enemy combatants killed during this movement. Upon closing with the enemy position, when two of his fellow Marines fell to enemy fire emanating from a fortified cave position, Corporal Arndt seized the initiative and ran fifteen meters under heavy enemy fire to a position just a few meters from the wounded Marines and just thirteen meters from the enemy’s fortified position. 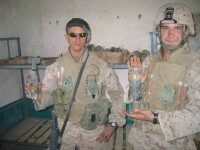 Over the next several minutes, Corporal Arndt selflessly and repeatedly exposed himself to enemy fire while attempting to extract his fellow Marines from the kill zone and while providing suppressive fires on the cave so that another Marine could throw a series of hand grenades into the cave until the enemy was silenced. As the cave was cleared, Corporal Arndt initiated life saving efforts on the two mortally wounded Marines and stayed by their side as the Corpsman arrived. Over the next twelve hours, Corporal Arndt assisted in carrying the two mortally wounded Marines nearly five kilometers over arduous mountain terrain and under enemy harassment to link back up with the platoon’s vehicles and complete their retrograde to their patrol base. By his zealous initiative, courageous actions, and exceptional dedication to duty, Corporal Arndt reflected great credit upon himself and upheld the highest traditions of the Marine Corps and the United States Naval Service.